Usually, I like my chili with lots of beans and veggies, so I was actually pretty nervous to make this since it only has one can of beans and a scant 1/2 cup of onion for veggies. When a friend shares a recipe with you that you’ve never tried, do you get nervous that you won’t like it? I’m probably ridiculous, but I feel almost obligated to like a recipe that comes highly recommended from a friend, and sometimes put off making it just for the fear that I won’t like it and will have to disappoint the friend when I tell them. But not this time! I was nervous, but I wasn’t going to wait–this recipe is special. Well, I needn’t have worried. This chili is spectacular! Spicy, hearty, meaty, with a wonderful & unique flavor. 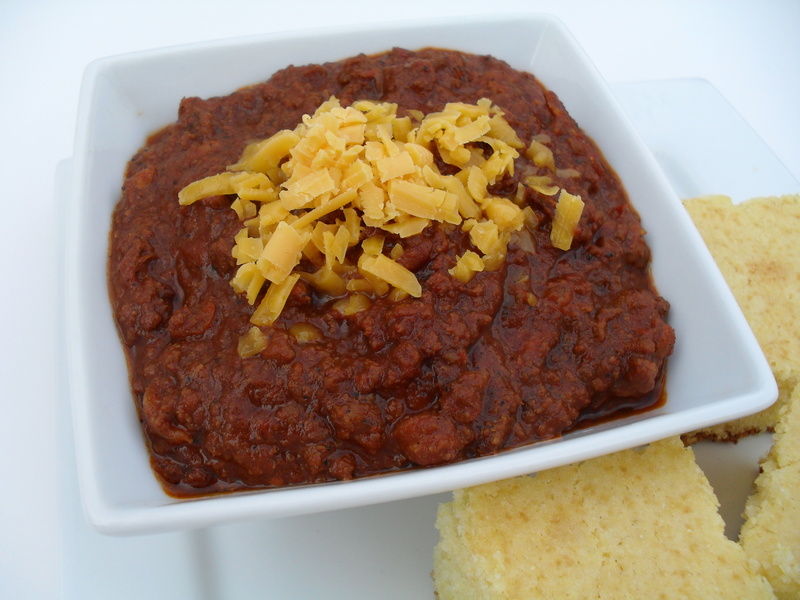 Once you scan the ingredients, you’ll see why it doesn’t taste like any other chili. 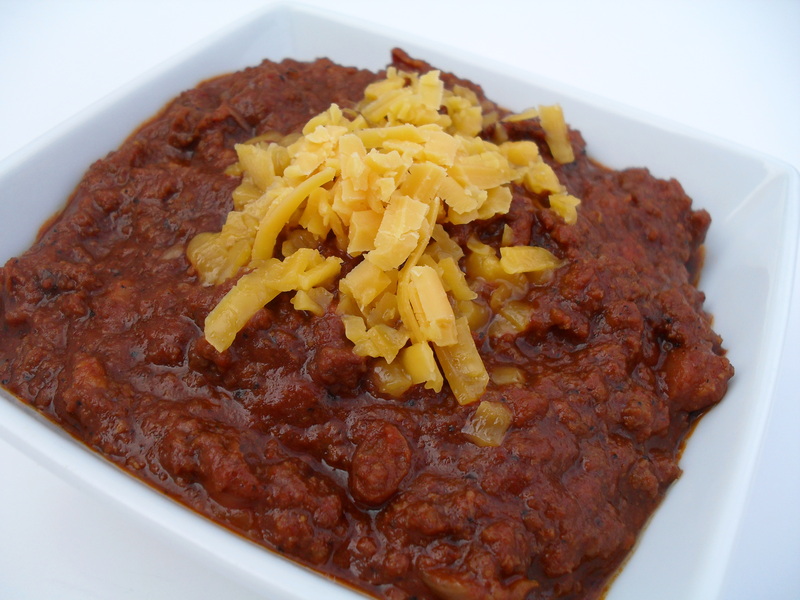 I bet you’ve never seen a chili recipe with bacon, chorizo, red wine vinegar, Worcestershire, sage, or maple syrup in it! My husband loved it and ate most of the batch by himself. In fact, he told me this was his favorite of any chili I’ve ever made! This is also the only chili that Suzie’s husband will eat so I’d say this is some real man-pleasin’ chili. Brown beef and chorizo. Drain grease, cover and set aside. Slice 1/2 lb. bacon into 1 inch pieces. Cook bacon until crisp, set aside on paper towels to drain off excess fat. Take 1 tablespoon of the bacon grease and add to the burger/chorizo mixture. Add all remaining ingredients, except bacon, to a large pot. Simmer for 3 hours, stirring occasionally and tasting to adjust salt, pepper, chili powder and red pepper flakes to taste. Let cool for an hour or so and then refrigerate overnight. Refrigerate the bacon separately. Simmer again the next day for 2-3 hours, adding bacon the last hour. It’s now ready to serve. Suzie recommends serving with homemade cornbread, so I served mine with Lighter Northern Cornbread. I also have a southern-style Homestead Cornbread recipe if you like yours without sugar and flour. Posted in Main Dishes, Soups & Stews and tagged beefy, blue ribbon, chili, hearty, meaty, prize winning, recipe, rich, spicy, winter. Bookmark the permalink. Well, tell Suzie that I just put this on the menu for next month! I love trying new chilis and this sounds unique and awesome! I can’t wait to try it! Yup. bacon, bacon grease, and maple syrup. Perfect! Chili is always better the second day. Yes, really, I said it was spicy! That didn’t floor me as much as the three tablespoons pepper–never used that much in anything. LOL! You can adjust the seasonings to taste, but we like things spicy so I left it as is. This sounds like a wonderful chili! I love a spicy chili but hubby does not, so I will cut back a little on the chili powder and hot sauce and just add it to mine later. The recipe says “one large can tomato juice”. Is that one of those 48 oz. cans? Honestly, most of the heat comes from the black pepper so I really suggest cutting back on that as well, to a teaspoon or less. And yes, a 46-48 oz can. Hope you like it! Thanks for sharing this treasure – so many yummy ingredients, I can just imagine how delicious the final result is! Is it really 1/2 cup of chili powder? Yes, but if you don’t like things spicy, just add the chili powder and black pepper to taste. Wow, a secret recipe!! And with chorizo to boot! I’m in. Thanks for the shout out V!! I had to laugh at the comments about the chili powder…ha!! Yep, it’s really that much…to me the end result is not that spicy seeing how much it makes :) As for the beans, I only add 1 can due to zee picky husband ;) Oh yeah, and I forgot about writing that comment to you…too funny!! Bacon grease?!? I love it. I am going to give this one a try over the weekend! I know this is more than 3 years later, but I asked under another person’s comment about how large is a “large can of tomato juice”. Is it a 48 oz. can? Because I haven’t made this yet (I am going to try it for an office party next week), I was just wondering about the size. 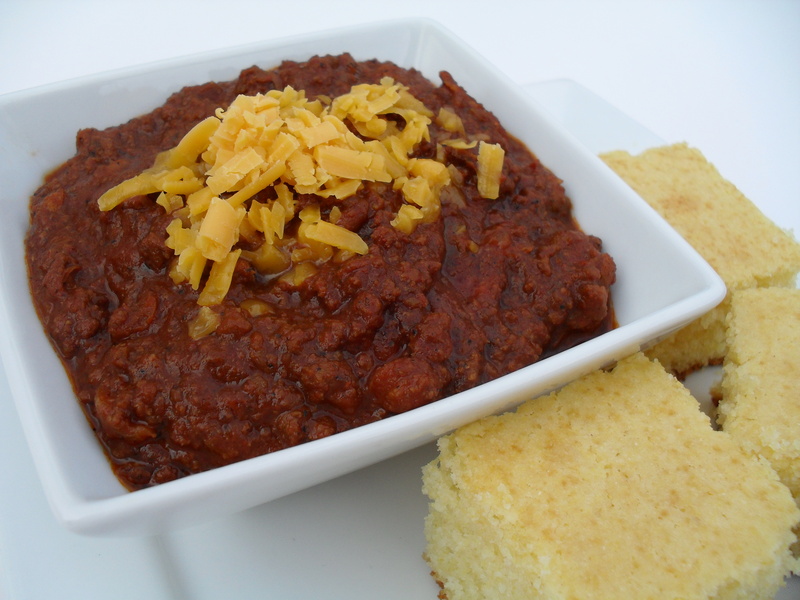 Thanks for sharing this great sounding chili! Yes, 46-48 oz is the correct size! I should update that, thanks for pointing out the omission!